Video abstract presented by Noratep Kulachote. Background and purpose: Salvage hip arthroplasty (SHA) in patients presenting with failed internal fixation after intertrochanteric fracture (FIF-ITFx) is a difficult procedure, and the incidence of perioperative mortality and complications following SHA are high. To our knowledge, no information related to the correlation between perioperative surgical factors and post-SHA perioperative complications in these patients has been demonstrated. This study aimed to identify the predictive factors for post-SHA perioperative complications in patients with FIF-ITFx. Materials and methods: A total of 32 patients with FIF-ITFx who underwent SHA between 2010 and 2017 were retrospectively reviewed. All patients had been followed for 1 year postoperatively. 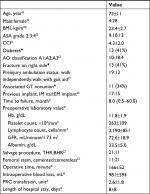 Perioperative data and complication details related to fracture and treatment were collected. Predictive factors for post-SHA perioperative complications were analyzed via logistic regression analysis. Results: Two (6%) patients died after SHA during the admission period. Perioperative complications were found in 16 (50%) patients, including surgical (n=3, 9%) and medical (n=15, 47%) complications, respectively. By univariate analysis, age (P=0.043), American Society of Anesthesiologist (ASA) grade 4 (P=0.016), Charlson Comorbidity Index (CCI; P=0.014), lymphocyte cell count (P=0.064), and serum albumin level (P=0.146) were correlated with the perioperative complications. 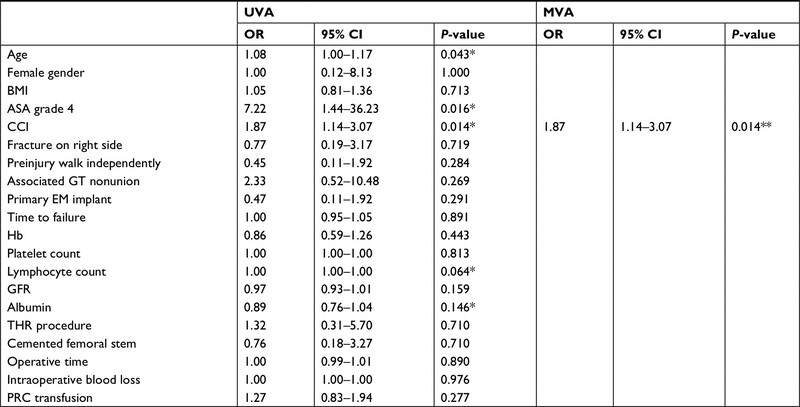 However, multivariate regression analysis showed that CCI was the only significant independent predictor for post-SHA perioperative complications in these patients (OR=1.87; 95% CI, 1.14–2.07, P=0.014). Conclusion: Our study showed that post-SHA perioperative complications in patients with FIF-ITFx are very common and predictable with a simple preoperative factor CCI. Therefore, special perioperative attention must be paid to patients with FIF-ITFx undergoing SHA and having multiple severe comorbid diseases or high CCI. Failed internal fixation after intertrochanteric fracture (FIF-ITFx) is a serious complication following hip fracture surgery and remains a challenging problem for fragility fracture treatment. The incidence of FIF-ITFx varies from 3% to 23%1,2 and is mainly caused by nonunion, cutout of the implant, and avascular necrosis (AVN) of the femoral head.1 Therefore, surgical intervention, such as salvage hip arthroplasty (SHA), is usually required for patients with FIF-ITFx to achieve pain-free hip motion and improve the functional outcome.3,4 However, in general, SHA in FIF-ITFx is technically demanding and more complicated than primary hip replacement5,6 due to distorted bone anatomy, poor bone quality from osteoporosis, and concomitant medical problems. Consequently, compared to primary hip replacement, SHA in FIF-ITFx requires longer operative time and has a greater amount of blood loss, which results in a postoperative mortality rate of 3.5%–17%7,8 and a high rate of perioperative complications (up to 42%),3,4,9 comprising both surgical and medical complications, such as intraoperative fracture, cardiopulmonary complication, and postoperative infection. Nonetheless, to our knowledge, no previous study has investigated the correlation between perioperative surgical factors (PSFs) and post-SHA complications in patients. Therefore, the purpose of the present study was to identify the predictive factors for the post-SHA perioperative complications in patients with FIF-ITFx by comparing those with and without perioperative complications after receiving this salvage surgery. This was a single-center retrospective study in a medical university hospital, and prior approval was obtained from ethical clearance committee of Human Rights Related to Research Involving Human Subjects of the Faculty of Medicine Ramathibodi Hospital, Mahidol University (protocol ID: 04-59-53), based on the Declaration of Helsinki. Owing to the ethical approval in the retrospective study and all data gathered from medical records, the requirement of consent was waived. The patients with FIF-ITFx who underwent SHA from 2010 to 2017 were identified from the hospital electronic database and then recruited into this study. The inclusion criteria were patients who 1) were aged >50 years and had an initial diagnosis as intertrochanteric fracture from low-energy trauma; 2) were diagnosed with FIF-ITFx and treated with SHA at our institution; 3) had follow-up data and a complete set of radiographs available for analysis (initial injury, after first operation, at time of FIF-ITFx diagnosis, and post SHA); and 4) had at least 12-month follow-up period post SHA. The exclusion criteria were patients who 1) were diagnosed with infection after fracture fixation; 2) were treated with methods other than SHA, such as conservative methods or revision surgery with fixation; and 3) had a pathological fracture from a cause other than osteoporosis, such as a metastatic fracture. The collected demographic data included the following: age, gender, body mass index (BMI), comorbid diseases, American Society of Anesthesiologist (ASA) physical status, side of injury, preinjury ambulation status, fracture classification according to Association for the Study of Internal Fixation/orthopedic trauma association classification,10 the initial fixation implant, the time to fixation failure, indication for SHA, and the union status of greater trochanter (GT). Age and comorbid diseases were further used for calculating the Charlson Comorbidity Index (CCI).11 The implants were then classified into either intramedullary (IM) or extramedullary (EM) devices. The time to fixation failure was defined as the time between the first fracture fixation operation and the time that FIF-ITFx was first diagnosed. The indications of SHA – such as nonunion, femoral head cutout, AVN, and posttraumatic osteoarthritis (OA) – were recorded. All SHA procedures were performed by experienced arthroplasty surgeons within 2 weeks after FIF-ITFx diagnosis and using the same anterolateral hip approach with anterior hemimyotomy.14 The selection of surgical option (THR or BHR) and prosthesis depended on patient’s age, degree of acetabular cartilage injury, and bone quality with intraoperative evaluation of the bone stock after implant removal. THR, in all cases, was performed using cementless fixation of acetabular components. In cases with a significant acetabular bone defect from implant cutout, the acetabular reconstruction was then performed with autologous femoral head structural graft. The decisions on the type and the length of femoral stem were based on the bone quality, deformity, location of the most distal screw hole from previous fixation implant, and the intraoperative stability during the trial reduction. If the associated GT nonunion or intraoperative fractures were present, the fixation was performed with either locking plate or cerclage wiring, depending on the surgeon’s preference. Postoperative care and rehabilitation were accomplished by the same postoperative protocol. All patients were encouraged to engage in postoperative exercise as soon as possible. The patients were allowed to perform weight-bearing exercise with a walker as tolerated. Radiographic and clinical follow-ups were scheduled at 6 weeks, 3 months, 6 months, and 1 year postoperatively. MedCalc statistical software version 15.8 (MedCalc Software bvba, Ostend, Belgium) was used to analyze data. Continuous data were presented as mean and SD and compared with a Student’s t-test. Categorical data were presented as a ratio or number of cases with a percentage and compared with Fisher’s exact test or chi-squared test as appropriate. Risk factors for post-SHA perioperative complications were compared between the patients with and without complications. Univariate logistic regression analysis was used to evaluate the association between risk factors and complications, and the predictive factors with values of P <0.15 were calculated using multivariate logistic regression analysis with a stepwise approach. Significance was defined as values of P <0.05. From among 35 patients with FIF-ITFx who underwent revision surgery between January 2010 and June 2017, three patients were excluded due to infection (n=1) and revision with re-fixation (n=2). Therefore, a total of 32 patients with FIF-ITFx who had undergone SHA between January 2010 and December 2016 were recruited into this study. The patient demographic data are shown in Table 1. The average patient age was 73±11 years (range 53–88 years), and 28 of them (88%) were female. ASA grades 2, 3, and 4 were classified in nine (28%), 10 (31%), and 13 (41%) cases, respectively. Nineteen patients walked independently, while 13 of them walked with gait aid before having the fracture. The average CCI was 4.3±2.0 (range 1–10), and the median time to fixation failure was 8.0 months (range 0.5–60.0 months). Seventeen (53%) patients were treated with IM nails (15 proximal femoral nail antirotation and two Gamma nails), whereas 15 (47%) patients were treated with EM implants (10 dynamic hip screws, three angle blade plates, and two dynamic condylar screws). The indications for SHA were nonunion (n=4), femoral head cutout (n=19), AVN (n=6), and posttraumatic OA (n=3). Twenty-one (66%) cases underwent THR, while 11 (34%) cases underwent BHR. All cases with superolateral acetabular defect (n=3) were treated with femoral head autograft and fixed with cancellous screws. The associated GT fracture nonunion was found in 11 (23%) cases, who had been treated with either cerclage wiring (n=8, 73%) or locking plate fixation (n=3, 27%). The cemented femoral stem was used in 11 (34%) cases, and cementless femoral stem was used in 21 (66%) cases. The mean operative time and the mean estimated blood loss were 166±52 minutes (range 80–300 minutes) and 981±594 mL (range 150–2,500 mL), respectively. The average blood transfusion and the average length of stay were 2.6±1.8 units (range 0.0–8.0 units) and 8±8 days (range 3–40 days), respectively. Notes: *Value presented as mean±SD. ♦Value presented as a ratio of case having that condition. □Value presented as number of cases (percentage). #Value presented as median (range). Abbreviations: AO, Association for the Study of Internal Fixation; ASA, American Society of Anesthesiologist; BHR, bipolar hip replacement; BMI, body mass index; CCI, Charlson Comorbidity Index; EM, extramedullary; GFR, glomerular infiltration rate; GT, greater trochanter; Hb, hemoglobin; IM, intramedullary; PRC, packed red cell; THR, total hip replacement. 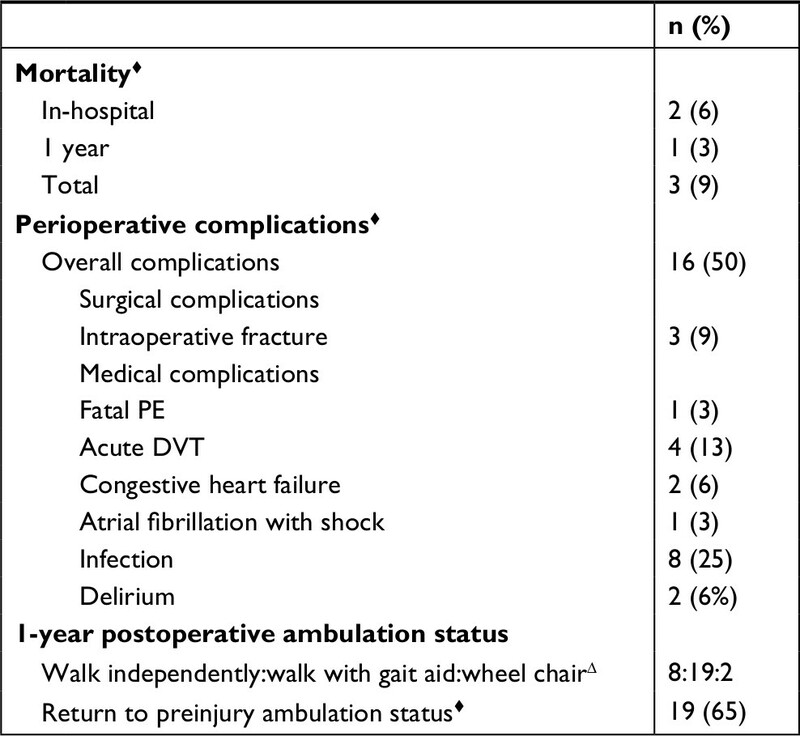 Table 2 demonstrates the postoperative mortality and the post-SHA perioperative complications. Postoperatively, two (6%) patients died within the admission period due to fatal PE (n=1) and sepsis from pneumonia (n=1). After discharge, another (3%) patient died at 6 weeks postoperatively due to pneumonia. 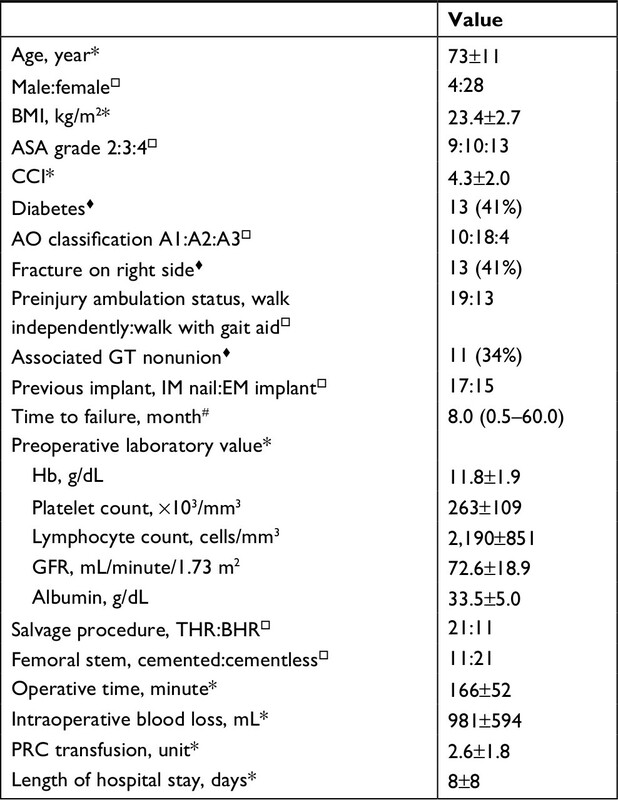 Therefore, the 1-year postoperative mortality in this study was 9% (n=3). Sixteen (50%) patients experienced at least one perioperative complication. The most common perioperative complication was infection (n=8, 25%; sepsis with pneumonia , pneumonia , and urinary tract infection ), followed by acute deep vein thrombosis (DVT; n=4, 13%). Intraoperative complication was documented in three (9%) cases using cementless femoral stem (two femoral shaft fracture at the distal tip of the femoral component and one medial calcar fracture). Intraoperative fractures were all treated by fixation, either with locking plate or cerclage wiring. Implant loosening, hip dislocation, or reoperation was not found during the 1-year follow-up period in this study. Notes: ♦Value presented as number of cases (percentage). ΔValue presented as a ratio of case having that condition. Abbreviations: DVT, deep vein thrombosis; PE, pulmonary embolism; SHA, salvage hip arthroplasty. 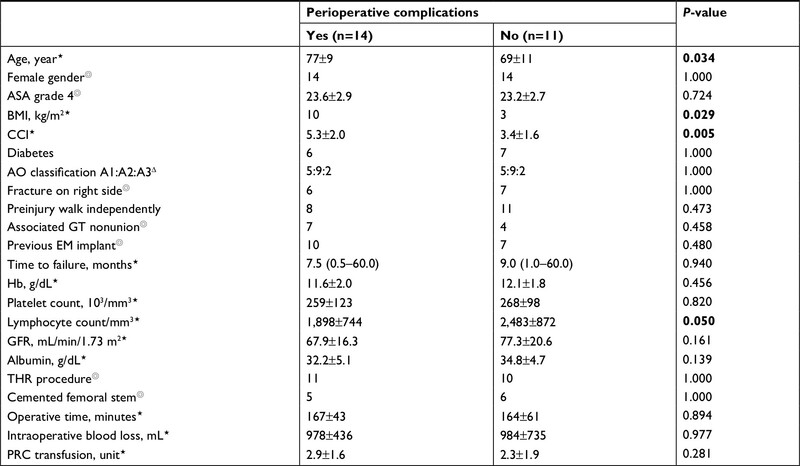 Table 3 gives the relationship between each risk factor and post-SHA perioperative complications. A simple comparison revealed that the patients with perioperative complications, compared to those without perioperative complications, had an older age (77±9 years vs 69±11 years, P=0.034), greater number of patients with ASA grade 4 (10 cases vs 3 cases, P=0.029), higher CCI (5.3±2.0 vs 3.4±1.6, P=0.005), and lower lymphocyte count (1,898±744 cells/mm3 vs 2,483±872 cells/mm3, P=0.050). Notes: ⋆Value presented as mean±SD. ◎Value presented as number of cases having that condition. ΔValue presented as a ratio of cases having that condition. P-values <0.05 are highlighted in bold. Abbreviations: AO, Association for the Study of Internal Fixation; ASA, American Society of Anesthesiologist; BMI, body mass index; CCI, Charlson Comorbidity Index; EM, extramedullary; GFR, glomerular infiltration rate; GT, greater trochanter; Hb, hemoglobin; PRC, packed red cell; SHA, salvage hip arthroplasty; THR, total hip replacement. Table 4 demonstrates the univariate and multivariate logistic regression analyses of the risk factors for the perioperative complications. Via univariate analysis, the predictive factors that were significantly associated with perioperative complications with P<0.15 were age (P=0.043), ASA grade 4 (P=0.016), CCI (P=0.014), lymphocyte cell count (P=0.064), and serum albumin level (P=0.146). However, multivariate logistic regression analysis demonstrated that CCI was the only significant independent predictor for post-SHA perioperative complications in patients with FIF-ITFx (OR=1.87; 95% CI, 1.14–3.07, P=0.014; Table 4). The area under the curve (AUC) of this prediction model was 0.777 (95% CI, 0.596–0.905). Notes: *Predictive factor in UVA with P<0.15. **Significant factor in MVA with P<0.05. Abbreviations: ASA, American Society of Anesthesiologist; BMI, body mass index; CCI, Charlson Comorbidity Index; EM, extramedullary; GFR, glomerular infiltration rate; GT, greater trochanter; Hb, hemoglobin; MVA, multivariate analysis; PRC, packed red cell; SHA, salvage hip arthroplasty; THR, total hip replacement; UVA, univariate analysis. Perioperative complications are very common after SHA in patients with FIF-ITFx.15–17 Nevertheless, the data related to the relationship between the PSFs and the perioperative complications are still unavailable. This study only aimed to find the predictive factors for post-SHA perioperative complications in patients with FIF-ITFx. Our study also had some limitations. First, our study population was relatively small due to the uncommon incidence of FIF-ITFx in only one medical university hospital. Therefore, other possible significant predictive risk factors, such as male gender, diabetes, obesity, type of previous implant, type of revision surgery, and blood loss, might have remained undiscovered. Second, regarding the retrospective nature of the present study, some clinical information possibly related to the postoperative outcome, such as smoking status and alcohol intake, was not available in all cases and, therefore, was absent from our analysis. Because of these limitations, the general applicability of the results may be inadequate; therefore, a multicenter prospective study with a larger sample size should be performed to explore the effect of other potential risk factors. Perioperative complications after SHA in patients with failed internal fixation after intertrochanteric fracture are very common and should be prevented to achieve the best possible postoperative outcome. This study showed that CCI was the only significant independent factor for predicting post-SHA perioperative complications. The authors wish to thank the Department of Orthopedics, Faculty of Medicine Ramathibodi Hospital, Mahidol University, for its kind assistance and the permission to carry out this study. NK and PS-N were the main researchers who designed and performed this study, analyzed the data, and prepared the manuscript. SW, KC, and CJ assisted in data collection and manuscript preparation. PF was the musculoskeletal radiologist who assisted in radiographic collection and interpretation. VJ and PM were senior orthopedic consultants who assisted in the research process. All authors contributed to data analysis, drafting or revising the article, gave final approval of the version to be published, and agree to be accountable for all aspects of the work. Broderick JM, Bruce-Brand R, Stanley E, Mulhall KJ. Osteoporotic hip fractures: the burden of fixation failure. Sci World J. 2013;2013:515197. Baumgaertner MR, Curtin SL, Lindskog DM, Keggi JM. The value of the tip-apex distance in predicting failure of fixation of peritrochanteric fractures of the hip. J Bone Joint Surg Am. 1995;77(7):1058–1064. Pui CM, Bostrom MP, Westrich GH, et al. Increased complication rate following conversion total hip arthroplasty after cephalomedullary fixation for intertrochanteric hip fractures: a multi-center study. J Arthroplasty. 2013;28(8 Suppl):45–47. Zhang B, Chiu KY, Wang M. Hip arthroplasty for failed internal fixation of intertrochanteric fractures. J Arthroplasty. 2004;19(3):329–333. Laffosse JM, Molinier F, Tricoire JL, Bonnevialle N, Chiron P, Puget J. Cementless modular hip arthroplasty as a salvage operation for failed internal fixation of trochanteric fractures in elderly patients. Acta Orthop Belg. 2007;73(6):729–736. Goldstein WM, Branson JJ. Modular femoral component for conversion of previous hip surgery in total hip arthroplasty. Orthopedics. 2005;28(9 Suppl):S1079–S1084. Mortazavi SM, R Greenky M, Bican O, Kane P, Parvizi J, Hozack WJ. Total hip arthroplasty after prior surgical treatment of hip fracture is it always challenging? J Arthroplasty. 2012;27(1):31–36. Haidukewych GJ, Berry DJ. Hip arthroplasty for salvage of failed treatment of intertrochanteric hip fractures. J Bone Joint Surg Am. 2003;85-A(5):899–904. Winemaker M, Gamble P, Petruccelli D, Kaspar S, de Beer J. Short-term outcomes of total hip arthroplasty after complications of open reduction internal fixation for hip fracture. J Arthroplasty. 2006;21(5):682–688. Kellam JF, Meinberg EG, Agel J, Karam MD, Roberts CS. Introduction: Fracture and Dislocation Classification Compendium-2018: International Comprehensive Classification of Fractures and Dislocations Committee. J Orthop Trauma. 2018;32(Suppl 1):S1–S10. Charlson M, Szatrowski TP, Peterson J, Gold J. Validation of a combined comorbidity index. J Clin Epidemiol. 1994;47(11):1245–1251. Healy WL, Iorio R, Clair AJ, Pellegrini VD, della Valle CJ, Berend KR. Complications of total hip arthroplasty: standardized list, definitions, and stratification developed by the Hip Society. Clin Orthop Relat Res. 2016;474(2):357–364. Carpintero P, Caeiro JR, Carpintero R, Morales A, Silva S, Mesa M. Complications of hip fractures: A review. World J Orthop. 2014;5(4):402–411. Thomine JM, Duparc F, Dujardin F, Biga N. Transgluteal approach to the hip by anterior hemimyotomy of the gluteus medius. Rev Chir Orthop Reparatrice Appar Mot. 1999;85(5):520–525. Dehaan AM, Groat T, Priddy M, et al. Salvage hip arthroplasty after failed fixation of proximal femur fractures. J Arthroplasty. 2013;28(5):855–859. Tetsunaga T, Fujiwara K, Endo H, et al. Total hip arthroplasty after failed treatment of proximal femur fracture. Arch Orthop Trauma Surg. 2017;137(3):417–424. Lee YK, Kim JT, Alkitaini AA, Kim KC, Ha YC, Koo KH. Conversion hip arthroplasty in failed fixation of intertrochanteric fracture: a propensity score matching study. J Arthroplasty. 2017;32(5):1593–1598. Hammad A, Abdel-Aal A, Said HG, Bakr H. Total hip arthroplasty following failure of dynamic hip screw fixation of fractures of the proximal femur. Acta Orthop Belg. 2008;74(6):788–792. Thakur RR, Deshmukh AJ, Goyal A, Ranawat AS, Rasquinha VJ, Rodriguez JA. Management of failed trochanteric fracture fixation with cementless modular hip arthroplasty using a distally fixing stem. J Arthroplasty. 2011;26(3):398–403. Castillón P, Bartra A, Vallejo G, Salvador J, Torres R, Anglés F. Hip arthroplasty with conventional stem as rescue treatment after failed treatment of intertrochanteric hip fractures. Rev Esp Cir Ortop Traumatol. 2013;57(3):194–200. El-Ghandour S. Endoprosthetic replacement for failed internally fixed intertrochanteric hip fractures. Egypt Orthop J. 2014;49(1):61–68. Shi X, Zhou Z, Yang J, Shen B, Kang P, Pei F. Total hip arthroplasty using non-modular cementless long-stem distal fixation for salvage of failed internal fixation of intertrochanteric fracture. J Arthroplasty. 2015;30(11):1999–2003. Menzies IB, Mendelson DA, Kates SL, Friedman SM. The impact of comorbidity on perioperative outcomes of hip fractures in a geriatric fracture model. Geriatr Orthop Surg Rehabil. 2012;3(3):129–134. Lin JC, Wu CC, Lo C, et al. Mortality and complications of hip fracture in young adults: a nationwide population-based cohort study. BMC Musculoskelet Disord. 2014;15:362.